The following story from the Associated Press of Pakistan appears to be a rather strident statement of defiance concerning the future of nuclear weapons in Pakistan. (Pakistan is believed to have about 50.) But all this nuclear saber-rattling may be a distraction, a radical-sounding but ultimately fairly meaningless statement whose main purpose is to draw attention away from a stunning revelation which the government would prefer to see ignored. Prime Minister Shaukat Aziz Monday said Pakistan will never compromise on its nuclear assets and will not allow anyone to cause harm, as these are vital for its sovereignty and security. 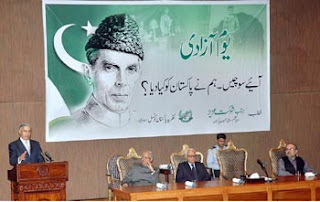 “Pakistan’s strategic capabilities as a nuclear and missile power are an important factor that not only ensures its security and sovereignty but also progress,” he said this while addressing a seminar titled, Let’s think what did we give to Pakistan, organized by Pakistan Ideological Council (PIC) here at Prime Minister Secretariat. The Prime Minister said progress and development are linked with defence and every citizen of the country is ready to defend and will never compromise on national nuclear assets. Shaukat Aziz said Pakistan of today and tomorrow is not the Pakistan of yesterday, adding that over the past 8 years the government has worked hard to implement broad based multi-sectoral reforms that have revived and repositioned the country. This map shows Pakistan's "traditional" position -- that's the Pakistan of yesterday. If I'm right, and this is a stealth move, we may never see a map of the repositioned Pakistan, Pakistan of today and tomorrow. I think this is a big story, don't you? How easy is it to reposition a country of 170 million? And to think they're trying to do it in secret!! Referring to the foreign policy, Shaukat Aziz said Pakistan wants good relations with every country and is engaged with the Afghan government to help bring peace and stability to Afghanistan which is in the interest of Pakistan as well. On issue of Kashmir, the Prime Minister said every Pakistani desires its peaceful solution which is necessary for progress. “We remain confident that the Kashmir dispute would be resolved in accordance with the aspirations of the Kashmiri people which will be beneficial to all,” he said. Regarding religious seminaries, he said these are part of our society and playing an important role in imparting both worldly and religious education. “The government has always supported the religious seminaries, but at the same time we do not want that any one is exploited on the name of religion,” he added. What is this "peaceful solution" crap? Peace and stability? the aspirations of the people? beneficial to all? They're madmen, I tell you! Madmen!! I'll keep an eye on this story, of course, and when the new maps come out -- if they come out -- you'll be the first to know.